Anxiety is an emotional state that is characterized by worry, irritability, and panic. When someone feels anxious, it can be hard to handle day-to-day life, and anxiety can also build tension in the muscles and cause other physical problems. Many menopausal women experience mood swings and are at a higher risk for experiencing anxiety. Mood swings may happen due to the decline in estrogen during menopause, which lowers brain chemicals like serotonin and endorphins and increases levels of the stress hormone, cortisol. 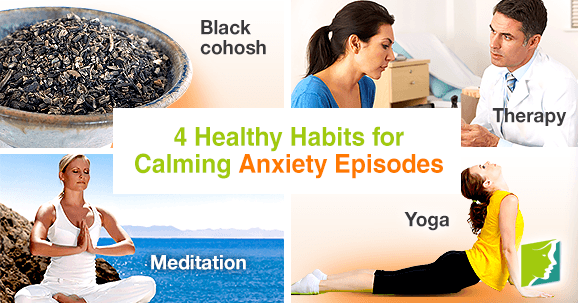 However, no matter what is causing your anxiety, there are healthy habits you can start that will reduce your anxiety. Receiving psychological treatment on a regular basis can be beneficial for people who suffer from anxiety. One of the most commonly used types of therapy to treat anxiety disorders is called cognitive behavior therapy. This helps people to recognize the difference between productive and unproductive worry. Unproductive worry is what builds up and can cause anxiety. Cognitive behavior therapy can also teach a person how to use relaxation and breathing techniques to control anxiety and anxiety-caused tension. Countless studies have discovered the soothing benefits of meditation. This activity helps you to control your thoughts and experience relaxation. It can be difficult at first, but when you practice it regularly and correctly, you will eventually notice better coping abilities. To begin your practice, turn on music that relaxes you, close your eyes, and deeply inhale into your belly with positive intentions and uplifting visualizations. On the exhale, release all of your worries. Continue for 20 minutes and try your best to make time for it each day. Yoga is a series a balancing, stretching, and strengthening poses that bring balance to the body and mind. Through movement and breath, practitioners work through challenges with focus and optimism. The practice helps individuals relieve stress, increase flexibility, and reflect. This is possible through the increase in gamma-aminobutyric acid (GABA) throughout the session, which helps create tranquility and may be responsible for the positive feelings many people experience after practicing yoga. Join a local yoga studio's introductory courses or try a beginner DVD to get started. Black cohosh contains phytoestrogens, which are compatible with estrogen receptors in the body, and this causes the phytoestrogens to act like estrogen in the human body. Black cohosh is one of the most popular herbal remedies for menopausal symptoms, so if you feel like your anxiety is a result of mood swings caused by menopause, black cohosh may be a good choice for you. Consult your physician to find high-quality supplements or teas. Anxiety can be overwhelming, but these healthy habits should help you learn how to handle your anxiety. Whether it's a comforting herbal tea, mindful meditation, or physical activity, taking steps to combat anxiety is a good idea. It is possible to reduce anxiety and control the impact it has on your life. Click on the following link for further information on treatments for anxiety in menopausal women.